many good traditional Catholic religious items! 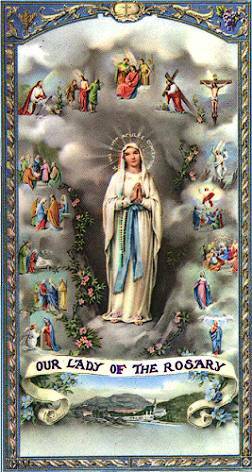 Our Lady of the Rosary Library is dedicated to working for the glory of God and the salvation of souls, as there is no more profitable endeavor. We provide literature to our readers that we feel will best aid them in perfecting themselves and saving their souls. To our non-Catholic readers, we must stress that there is no salvation outside the Catholic Church, the only Church founded by Our Lord, and we strongly exhort them to study carefully this assertion of the Church, having the good will to peruse some of our articles on this matter. We would like to remind our Catholic readers that their salvation is by no means assured and they should struggle daily to battle the world, the flesh, and the devil. This should be a motivation to read and to learn about the Church, to seek out the Truth on various controversies, and to increase one's fervor. Above all, Catholics should heed the call of Our Lord to Win Souls For Him by ordering in volume the literature we offer, which includes several books and booklets, at such affordable prices and being zealous about distributing it to others. We invite all to read the material we present, print it out, and distribute it if they desire, without changing the text. If you have any questions whatsoever, please feel free to e-mail us.